I was going to do a burger, but then decided that I would like it even more with some runny yolk. And there you have it: my new favorite breakfast or brunch. I’ll likely eat it for lunch and dinner too. I’m quite obsessed. The salty fat soaks into the kimchee, which adds that kick and brightens with some acid. 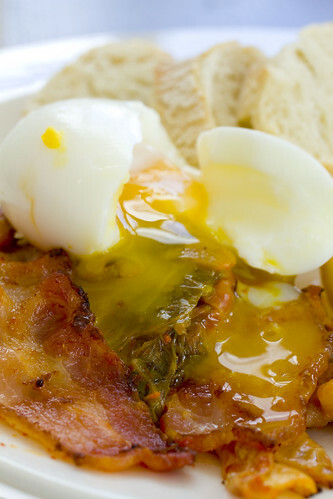 Everything is better with a runny egg, natures rich yellow sauce. It’s complete with some fresh toasted bread to sop and carry the flavors to your mouth. Let’s talk about the eggs, the 6 minute eggs. You may have seen it on Top Chef when Michael Voltaggio made them to showcase some farm fresh local eggs. They’re very soft boiled eggs, where the whites are delicate and just holding together. The yolks are completely running. You can also think of it as an egg poached in it’s shell to hold better shape. For a more in depth and scientific explanation, J. Kenji Lopez-Alt does a great article on Serious Eats. They are my favorite way to have eggs now and all it takes is simmering whole large eggs for 6 minutes (or extra large eggs for 7 minutes). Place them in ice water immediately to stop the cooking, and peel the shells very gingerly. 1. Prepare an ice bath and set aside. 2. Start simmering water. 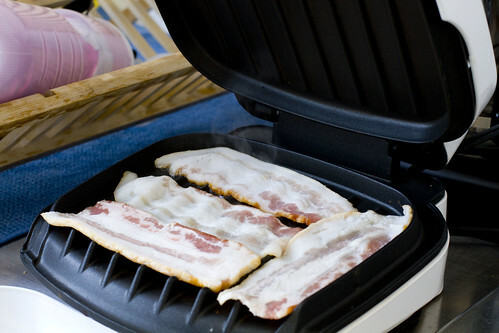 Preheat George Foreman Grill or a cast iron pan on your stove. 3. Add eggs to simmering water and try to maintain at a simmer for 6 minutes (7 minutes for extra large eggs). 4. While eggs are simmering, place bacon on grill or cast iron pan. Cook for 2 minutes. 6. When the eggs are done simmering, place in ice bath immediately. Gently crack egg shells, being careful not to bang too hard. The whites are very delicate. Peel off the shells. 7. Serve the 6 minute eggs with the bacon and kimchee. Serve with choice of bread. posted by jessica	at 08:10 AM	Filed under Fusion, Recipes. You can follow any responses to this entry through the RSS 2.0 feed. Both comments and pings are currently closed. Wow! This looks wonderful and such comfort food! I am all about that! Lovely blog! I will be back! What a scrumptious meal! Those eggs look so good! you have attained egg perfection, if your photos are any indication. bravo. I just recently made a bacon and kimchi egg salad. 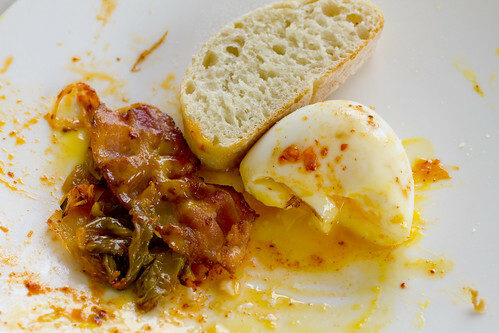 I’ll have to try your “deconstructed” version, because runny yolks are the bomb. No wonder our son says the best breakfast he’s ever had was in New York!! Such wonderful combinations when East meets West! 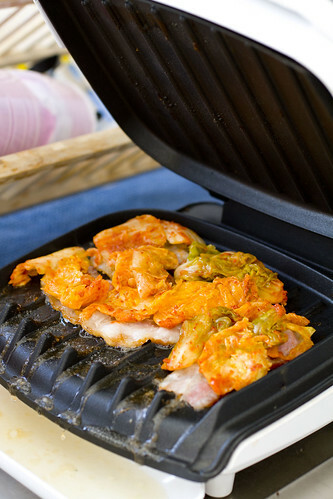 Vicki, I’m convinced that bacon and kimchee is one of the best pairings n earth now! And I agree about perfectly cooked eggs. It’s really important. I’ve had kimchee, never made it, and doubt my tummy would like it for breakfast! you’ve become the EGGspert!! First the steamed scrambled eggs now this! Barbara, I didn’t like him during the show but I’m going to give him the benefit of doubt because I know these shows try to play up the drama and people come out seeming like something they’re not. Nasty makes for better TV. On kimchee, I happen to have an iron stomach but it’s not for the sensitive. Wow Jessica… I saw your tweet about this and it made my mouth water but now you’ve blown my mind. I love runny eggs, but have never thought to remove the shell. What a fantastic idea! Thanks and gorgeous pics. What a fabulously looking meal!! Looks so tempting too! Vanessa, it’s prob great for kids to have the shells peeled already. Less mess. 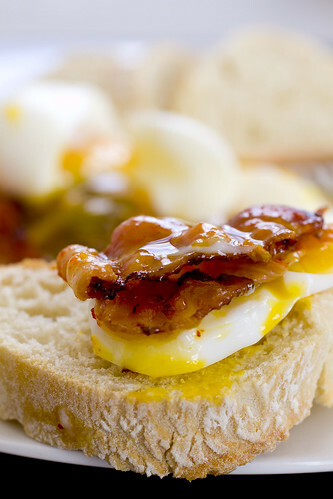 Sigh..you can make bacon eggs looks so yummy.. is it all because of brilliant or lit bit good food photography as well. Indeed love your blog. these delicious dishes look awesome.hope these yummy in taste.I am definitely going to do some special in daily taste.